Bus from Batu Pahat to Shah Alam has played a key role in connecting people between the two cities. Many locals rely on this bus service because there is no other mode of transportation available from Batu Pahat to Shah Alam. By taking a direct bus from Batu Pahat to Shah Alam, passengers can save their transit time in Kuala Lumpur, which is usually by transferring bus or KTM train to Shah Alam. KKKL Express and Transnasional are a few bus operators who supply bus from Batu Pahat to Shah Alam. These bus operators have been providing excellent quality and affordable bus service to passengers in Malaysia for many years. Their combined trips have a total of up to 7 daily departures from Batu Pahat to Shah Alam. The first bus starts in the morning 8:00am. The following bus schedules are 8:30am, 12:30pm, 2:00pm, 2:30pm, 8:00pm and 8:30pm. 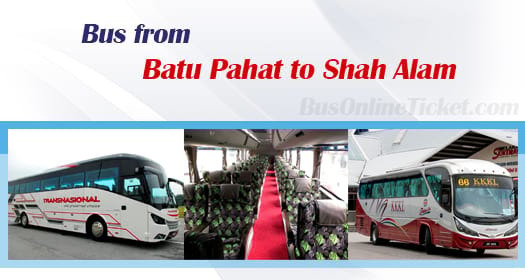 The duration required for bus from Batu Pahat to Shah Alam is approximately 4.5 hours. Please note that the actual travelling time for bus from Batu Pahat to Shah Alam depends on the traffic condition along the route. Washroom break will be given during the journey. The bus fare from Batu Pahat to Shah Alam is reasonably priced in a range of RM 25.30 to RM 28.00. The pick-up point in Batu Pahat is located at Batu Pahat Bus Terminal while the drop-off point in Shah Alam is located at Shah Alam Bus Terminal. From Shah Alam Bus Terminal, passengers can take a taxi or intercity bus to your next destination. Booking your bus ticket from Batu Pahat to Shah Alam via BusOnlineTicket.com is very easy and secure. You are advised to book your bus ticket in advance, especially during peak seasons and weekends. By booking bus ticket at BusOnlineTicket.com, you can enjoy instant confirmation of your booking after the payment is made.